According to the eco-friendly organizations about 20% of the fresh water supply in the US is wasted by flushing. In addition, each year it is estimated that, even though approximately 340 billions of gallons of water are withdrawn from lakes, reservoirs and rivers, only 65% of that water will be returned to its original source, sadly in the form of treated water. The high demand of water for both commercial and private use has considerably dropped the water levels over 100 feet. However, the good news is that the Energy Policy Act, mandated in 1992, has led to the introduction of water saving toilet basins and fixtures for all types of consumers. 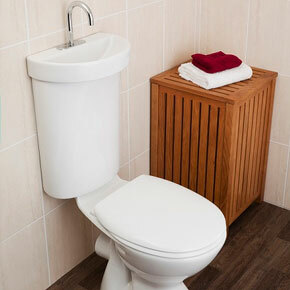 Whilst it is true that the best way to reduce water consumption for your toilet is to replace your old model with the newer water saving toilet basins, for some people this is not an option. Nonetheless, until they have gathered enough cash to purchase new water saving toilet basins, there are a few things homeowners can do to preserve water, that they will be glad to know will also reflect in their water bills. Therefore, the simplest thing a homeowner can do is to check for leaks, by adding colored water into the tank and then observing its movement in the bowl. In case the toilet was not flushed and the water in the bowl is colored, then it is clear that there is a leak in the lavatory. The dual flush system is meant to conserve water by using less of it to dispose of the liquid waste than for solid waste. On the other hand, the low flush toilets are those that employ the help of air pressure or pumps to add extra force to the water used on the flush. Whilst the dual flush uses 3 liters per liquid waste and 6 liters per solid waste, the low flow always uses 6 liters. Whilst the initial models presented a lot of problems, as the person using the toilet needed to flush several times, currently both systems have been optimized and improved. Normally, by installing a low flow or a dual flush system in your household, the water savings in an average two or three person home in a year are of approximately 30,000 gallons or almost 30% of the total water used in a household. These numbers translate into more than $100 saved on water bills per year.